Bridestory Market is back and this time with bigger and better concept than ever before. Held in ICE BSD, the exhibition will be open from 19 – 22 July 2018. Like last year's Bridestory Market, European night market will still be this year's theme but with a more colorful flair this time around. Joining the expo are more than 750 wedding vendors across 20+ categories from Indonesia, Singapore, Malaysia and other countries. 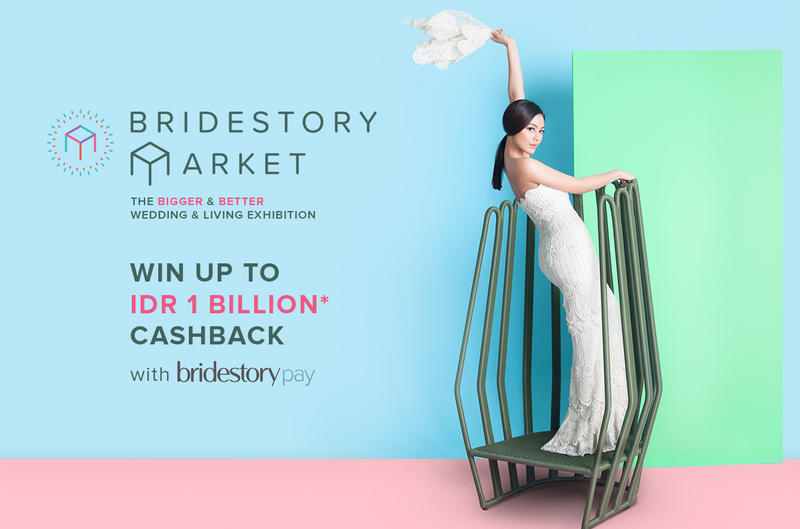 And now with the convenience of Bridestory Pay, you can directly upload deals and quotations, remind your clients to pay, receive your payment ever so easily, and give your clients a chance to win cashback* up to IDR 1 Billion, on us! And, visitors can also get a chance to win JAK 101 FM's hosts as their wedding MC and famous musicians to entertain the wedding guests. But wait, there's more. Right after the wedding day and honeymoon, one of the very first things newlyweds will be occupied with is finding and furnishing their first home together. In Bridestory Market 2018, we have collaborated with rumah123.com to provide the best property listings and also, launched the brand new Bridestory Living Area. In collaboration with the renowned Alvin Tjitrowijo, the 200 booths in the Living Area will take visitors to meet talented architects, interior designers, developers and home & furniture vendors who will help them build a home. So now, couples can conveniently plan their dream wedding and their first home while visiting Bridestory Market. That's not all, Hilda by Bridestory also joined in the excitement by hosting wedding- and home-related classes to equip visitors for the wedding planning process and the marriage itself. Talented and experienced tutors will be teaching and every class will be held during Bridestory Market. With all the fun stored in Bridestory Market, It is definitely a place suitable not only for engaged couples but also for the whole family. Bring along as many friends and family as you can and enjoy your weekend at the F&B booths, in collaboration with Market & Museum. Mark your calendars for 19 – 22 July 2018 and see you on Bridestory Market 2018!